i don't know if this belongs to this section but i wrote a small text about the country where i live. Maybe you're interested. Feedback appreciated. „Schaumburg-Lippe“ (1647-1807), originated from the „Grafschaft Schaumburg“ (Shire Schaumburg), a Territory in the „Holy Roman Empire“ (approximately 1106-1647), joined in 1807 the „Rheinbund“ (Confederation of the Rhine) and became „Fürstentum Schaumburg-Lippe“ (Princedom Schaumburg-Lippe). It is a rural area near the „Wesergebirge“ (Weser Hills), also known as „Weserkette“ (Weser Chain), form of a low hill chain where also stands the big monument of „Kaiser Wilhelm“ (Emperor William I, King of Prussia 1871-1888). At the time of Napoleon, the King of Prussia was „Friedrich Wilhelm III“ (Frederick William III, 1797-1840). It is located in lower Saxony, about 50km south-west of Hanover, Germany, near Minden. They fought 1808-1810 in Spain for Napoleon. Many of them were servants, sold by their lords or sent to war instead of themself. The times were hard, most of them had no choice. On 22. June 1812 crossed the Napoleonic Army of Europe the Russian border. 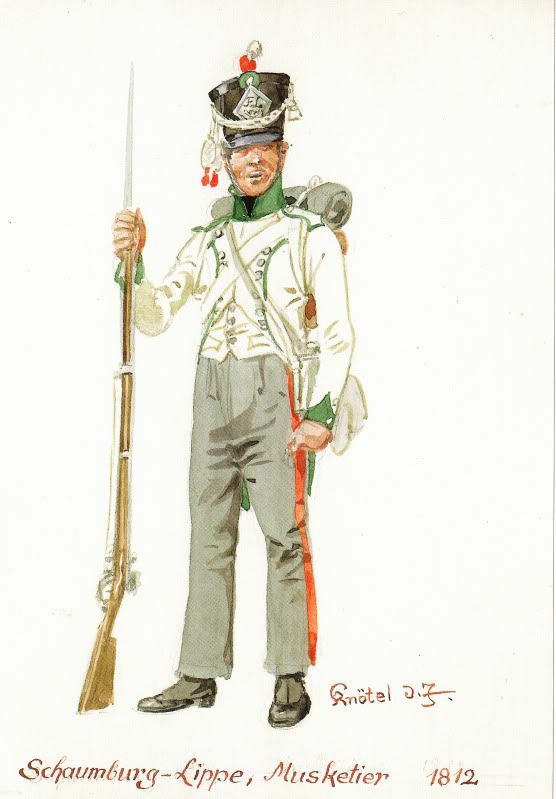 The french „Grande Armèe“ was a multinational Troop with at most 30% french Soldiers. The biggest Contingent were Germans with about 130.000 Men of the 500.000 total but also Polish, Italian, Swiss, Croatian, Spanish and Portugese. Including 150 brave men of the „Fürstentum Schaumburg“. More of them fought later at Waterloo on both sides, the french and british/prussian. Most of them were doomed to death but their story wasn‘t forgotten and went into history forever. In some death certificates stood the death reason. Things like „both thighs shot to pieces, he shot himself“, „stabbed by Cossacks“, „died by typhus“, „died at siege“, „killed at a raid“ or „killed in dispute with a french Baker“. Many of them died as prisoner, on the field of war or were missed and never found again. The top to bottom three-lined flag had the colors "white-red-blue". In 1815 the Princedom joined with 33 other states the „Deutscher Bund“ (German Confederation, 1815-1848), preceded by the „Confederation of the Rhine“, „Austrian Empire“ and „Kingdom of Prussia“. It was the end of the „Sixth Coalition War“ with many dead men.